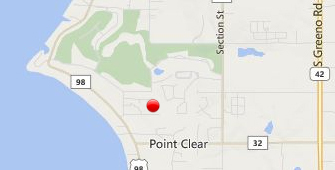 Already own a home in the Point Clear Woods subdivision? Thinking of selling? Click here and read about current search trends & our web network. Point Clear Woods homes for sale in Fairhope, AL are listed on this page and along with current listings for homes for sale in Point Clear Woods, is an interactive Google map, pictures, area info, property details and other useful sales info for Point Clear Woods subdivision in Fairhope. The subdivision is located just South of Lakewood Country Club and approximately 10 minutes from downtown Fairhope; only because of the speed limit. The actual distance is approximately is less than three miles. The homes in Point Clear Woods are close to a variety of great restaurants, unique shopping boutiques and entertainment venues. Also close-by is the beautiful beaches of the Alabama Gulf Coast. Gulf Shores and Orange Beach is approximately 35 minutes from the Point Clear Community. The closest airport lies in West Mobile, AL and is under an hour. If you need further info, have questions or would like to schedule a viewing for any of the homes for sale in Point Clear Woods or any other properties in the area, please email info@condoinvestment.com or call (251) Area-Pro (251-273-2776) for immediate assistance.